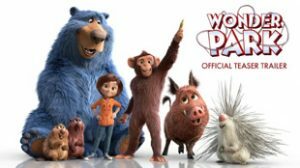 We stumbled across an interesting article about a new series of animated shorts coming to TV in South Africa. “NickToons in association with local animation studio, Sunrise Productions have proudly developed it’s first South African animation for the channel. 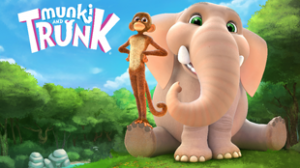 Munki and Trunk is a dialogue-free 3D animated TV series for kids aged 4 to 7. 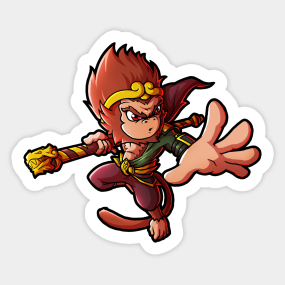 Munki is a vine-swinging force of nature, hungry for bananas and adventure. Trunk is a big-hearted elephant who loves to nurture and play. These unlikely best friends explore their world together, facing fears and helping friends along the way. It’s the most fun you can have in the jungle.” The show is produced by Tim Keller, and it premiers this month. No word at all if anyone plans to distribute it to other parts of the world, unfortunately. Grace Kum is a visual development artist and illustrator whom we met at the CTN Animation Expo. Recently she’s worked on Disney TV’s Big Hero 6 series, and various series for Dreamworks TV too. 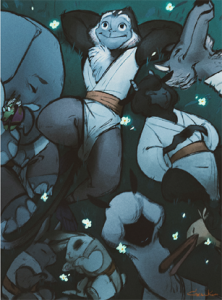 We’re spotlighting her because in her free time she’s been working with Dahyeu Celine Kim on a project called Higher Than The Sky, which they describe as “a prequel to Journey To The West” — which is, of course, the most famous story of the legendary Monkey King. According to Grace’s web site, this project is ready to get up and running again. 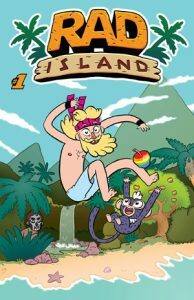 Um, we’ll let the folks at Kechal Comics explain it: “Placed in men’s tightie whitie underwear on a whim by the scientist who captures him, Baxter the monkey does the only logical thing possible – he instantly develops consciousness and the ability to speak. Because… SCIENCE!!! Excited by his discovery, the scientist decides to see if other animals react as well as Baxter. Gaining intelligence, rational thought and an innate understanding of justice and fairnesss. Let’s just say further experiments do not go as well. 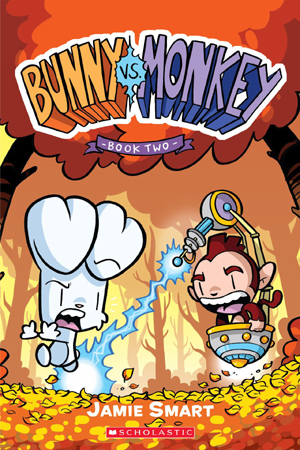 Join Baxter as he navigates a world he’s just starting to understand, a world full of fearful humans, zany animals, and one seriously deranged bunny rabbit.” See? We told you they’d say it better! Underwars #1 was written by Kevin Joseph and illustrated in black & white by C.M. Brennan, based on a series of paintings he did. That Spaceship Looks Like A Banana! Here’s another one that somehow flew over the moon yet under our radar for some time. 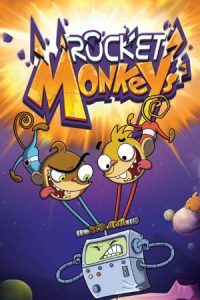 Rocket Monkeys was a 2D animated series from Canada (they get SO many interesting shows up there!) created by Dan Abdo and Jason Patterson. According to Wikipedia, “Brothers Gus and Wally are monkey astronauts. 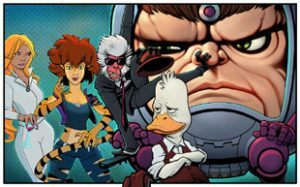 They’re not the brightest or coolest astronauts, but since they’re the only ones around, they are called upon to go into space and carry out different kinds of important missions—including battling rogue black holes and vengeful aliens. Other members of the brothers’ crew include bossy astrophysicist Dr. Chimpsky, who gives the monkeys their assignments; YAY-OK, a devoted robot that is slightly outdated and is the brothers’ only hope to help keep them on course; and Inky, a space octopus and artist who communicates through his ink drawings.” Looks as if the show ended it’s run in the US back in 2016. Fortunately, lots of episodes are still up and about on YouTube.